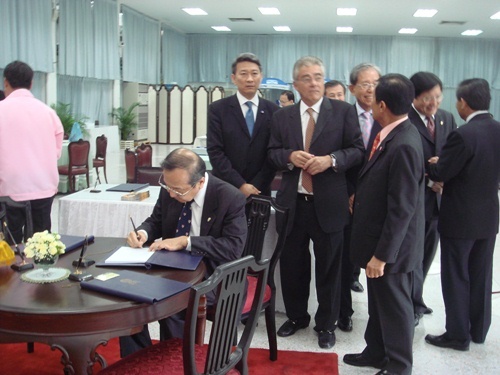 On August 9 General Phichit Kullawanitch, Privy Councillor and the advisory chairman of the project to develop Thai hill tribe villages under the royally-initiated project. traveled to visit the Pha Muang Task Force in Chiang Mai. He was welcomed and briefed on the project activities in Chiang Mai areas by Col Somsak Nilbancherdkul, the Deputy Commander. Dr. Nirund Jivasantikarn, the Honorary Consul for Belgium and his delegates were accompanied by the Honorary Consuls delegation of Thailand, led by Bansarn Bunnag, Director General of Protocol, Ministry of Foreign Affairs and Dr. Sriphum Suknetre, the Chairman of Honorary Consuls of Thailand together signed their names to wish His Majesty the King good health a a speedy recovery at Siriraj Hospital, Bangkok. 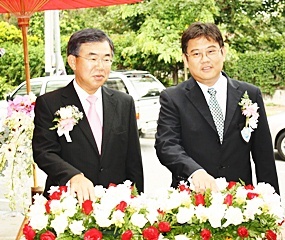 Mr. Mazashi Honda, Chairman and Managing Director of Fuji Xerox (Thailand) Co. Ltd and Narong Kongprasert, President of the Chiang Mai Chamber of Commerce pressed the button to open the new showroom of Fuji Xerox (Thailand) Co., Ltd ‘s Chiang Mai branch on Huay Kaew Road.